*MINI-MAKE* Create a beautiful long necklace to wear this Summer with a unique agate gemstone pendant and sparkling crystal chain. As featured on the Bead's Direct blog. Cut the chain to your desired length. I recommend a long chain for this project so between 28-32 inches long. (You could have enough chain remaining to make a matching bracelet!). 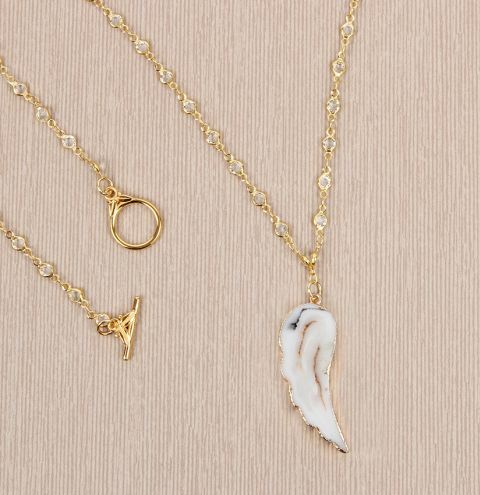 Open a jumpring with your pliers and loop it through the top of the angel wing charm. Connect it to the center of your chain, going through the chain link. Open 2 more jumprings and attach the toggle clasp to the ends of the chain.